Easily grown in medium to wet soils in part shade to full shade. Best in wet, humusy soils in part shade. This plant is an annual which remains in the landscape through self-seeding and can become somewhat aggressive under ideal growing conditions. Will often form large colonies in the wild. 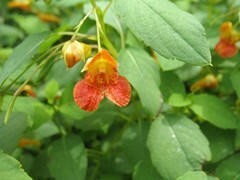 Impatiens capensis, commonly called spotted touch-me-not or jewelweed, is a Missouri native annual plant of boggy, shady areas. It typically occurs in low woodlands and thickets, along stream banks and in swampy areas throughout the State. It grows 2-5' tall on weak, watery stems. Features 1" long, rear-spurred, cornucopia-shaped, orange to orange-yellow flowers with reddish-brown spotting. Flowers bloom throughout the summer. Each flower dangles from a leaf axil on its own slender stalk. Flowers give way to slender seed capsules which when ripe explosively split open at a touch dispersing the tiny seeds within in all directions, hence the common name of touch-me-not. Oval, coarsely-toothed, bluish-green leaves (to 3.5" long). Native Americans used the watery plant juices to relieve itching associated with poison ivy, stinging nettle and insect bites. Genus name comes from the Latin word impatiens meaning impatient in reference to the violent seed discharge from the ripe pods. Specific epithet means of the Cape of Good Hope, South Africa, but this is a misnomer here as this plant is native to North America. Dew or rain beads up on the leaves forming sparkling droplets which give rise to the common name of jewelweed. No serious insect or disease problems. Can prolifically self-seed. Moist shade or woodland gardens. Bog gardens. Native plant gardens. Pond or stream margins. Low spots.